This New Year, New You hypnosis script is perfect to use towards the end of the year or the beginning of the new one when clients are thinking about their New Year Resolutions. Whether they wish to reinforce a desire to stop smoking, lose weight, achieve more goals in their life or overcome any other negative habit, it is easily adaptable and can help your clients to realize their potential in the coming new year. 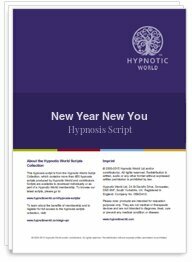 Download this New Year, New You hypnosis script today to help your clients to achieve their goals.